It’s not every day you get a note from a former president. However, a Whitehall man received a hand-written letter recently from the 39th President of the United States. 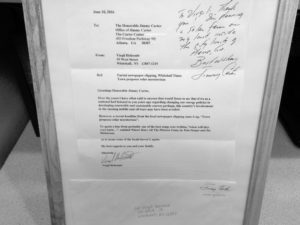 Holcomb framed the letter he received from former President Jimmy Carter. Virgil Holcomb, of West Street, sent a letter to former President Jimmy Carter, after reading the May 26 Whitehall Times. Because Carter was a proponent of renewable energy, Holcomb immediately thought of the 39th President when he saw the headline “Town proposes solar moratorium.” So Holcomb clipped out the article, typed a note and sent it to the former commander-in-chief. That letter was sent by Holcomb on June 10. Last week, Holcomb received a letter with the name “Jimmy Carter” on the return address. In a hand-written note, the 91-year-old Carter, the oldest living former president, thanked Holcomb for his letter and his statement of support for Carter’s energy beliefs, and added, “I’m planning a solar farm on my land, inside the city limits of Plains, GA.” The letter concluded with “Best Wishes” and Carter’s signature. Environmental policy was long a main concern for Carter. Carter hasn’t stopped his environmental advocacy in his old age, either. Just last week, it came out that he wrote the world’s richest man, Bill Gates, in an attempt to keep millions of tons of toxic coal ash out of a south Georgia landfill. Gates apparently is one of the largest shareholders in the landfill company. As for Holcomb, he has taken the hand-scribed note and the envelope it came in and framed them.